“I can’t say as ever I was lost, but I was bewildered once for three days. With my son Julian and his friend we rented the car at the Paris airport and set out for Normandy, but along the way dipped into the northern part of the city to circle the Arc de Triomphe. The roundabout there is six or eight or ten lanes wide—no lanes are marked— with a dozen roads radiating, and it swarms with cars at maniacal cross-purposes. Fun! The car served us well in a quick three-day tour of Normandy. 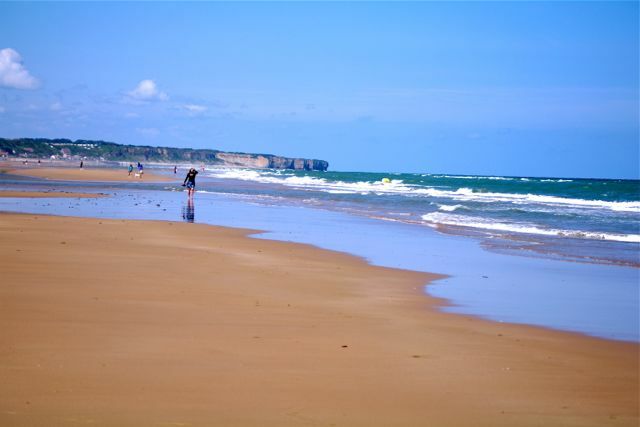 We visited the magnificent Mont Saint Michel, watched fireworks at Port en Bessin, and walked the calm shrine of Omaha Beach. The freedom of motion was great. Doesn’t look like the site of an invasion, does it? We also got lost every time. Not horribly lost, not trivially. I had foolishly said no to paying another $20 a day for GPS. The rental was already well over $100 a day for a very unglamorous car and I knew gas would be over $8 a gallon. Well, it was an unfortunate impulse, as Julian reminded me a few hundred times. Our map was terrible and the smartphone locator agnostic (“well, you might be in Spain”) or silent. The French countryside is not easily navigated. (Few things French are.) The roads are convoluted, the signs occasional, the route numbers cryptic, and the city names, well, foreign. Picture a web laid by a malevolent spider and intended to trap tourists in the Twilight Zone. And then there were the roundabouts—each an invitation to a lethal roulette. Pick the correct branch or else. The other drivers spiced it up. We saw a car one night driving around a roundabaout as fast as it could, tires squealing. We waited to enter until it was done. Then it came time to return the car in the Paris center. It was Sunday evening and quiet. On the way into town, we had tasted the monstrous excess of Versailles and hopped out to take a peek from beneath the tritely stately Eiffel Tower. It was nice to have the flexibility of driving but a car is a liability in the city, so it was time to get rid of it. It was getting dark and my two companions and I were tired. We dropped our bags at the hotel and then circled the Louvre for an hour. We were supposed to go to a place called Carrousel du Louvre which, I have now learned, is a mall concealed invisibly beneath the Place du Carrousel, itself not an amusement park but a public square or courtyard adjacent to the Louvre. A few dozen people were guillotined there in the revolution of 1792. No, I don’t think that’s coincidental. We could not find the agency on Rue de Rivoli despite being at the right address, or where it should have been. The street number was printed on the map but didn’t exist in the real world. It appeared to have been swallowed by the impassive face of the Louvre. But we were so tantalizingly close that I couldn’t quite let go and try somewhere else. That would violate The Plan. I had figured we’d walk back to our hotel in the Latin Quarter by way of Île de la Cité, the island home to Notre Dame. I pictured (hallucinated) providing the kids a lovely introduction to nighttime Paris. I planned it carefully, which guaranteed failure. Not finding the place wasn’t a GPS problem, but gave the same feeling of vacation minutes draining into something pointless. And so we found the place but didn’t. We drove into the Carrousel courtyard through an entrance in the side of the building, one of three slits in the building so narrow I thought it would take off the mirrors. No luck. I stopped and asked for help several times. (Airtz? Airtz anyone?) Still no luck. It got very dark. A while later we found ourselves again in the courtyard. It wasn’t the sort of place you were supposed to stop but I parked the car off to the side, yanked the brake, and jogged over to an idling police car. I figured surely the police would know where everything was. The officer at the wheel either didn’t know or didn’t understand, but then the back window rolled down and another officer with good English offered to help. She was an attractive young woman and very kind. I realized suddenly that there were four officers in the car. We went back to the street but the cops couldn’t find the number either. I handed them the rental agency map that had fifty sites listed in Paris and pointed out #27, my goal. “Voilà, je ne suis pas fou,” I pleaded. “Un peu,” I corrected. She laughed. She sent the two front-seat cops off to explore the building on foot. They were young and seemed to answer to her, whether out of chivalry or seniority I don’t know. I watched the reflective stripes on the legs of their pants flashing in the night, guns strapped to their hips, and felt very embarrassed. These were real cops, not crossing guards, and they were making us a priority. She and I chatted for a while standing in an emerging cool drizzle. Her engagement ring flashed prettily in the headlights. She asked me where I was from and said she had been an au pair near there. Yes, I was flirting ever so mildly. Chatting with a pretty cop was much more pleasant than my temptation to put the car in the Seine. Paris is quite beautiful in the rain until there’s too much of it. Buckets of rain finally drove us into our cars to wait for the others. They came back without success. “They think the office must be closed,” she told me. I wanted to ask them, hey, why can’t you use those guns? I was really hating the company at that point. But the problem was they couldn’t find the office to begin with, let alone shoot it. The police conferred and decided I should go to an agency office at the train station Gare de Lyon. They said they would lead us there. I really didn’t need help but took the offer. Off we went. After a few blocks they started using their siren to ease us through the red lights. I love the two-note French police siren. It clearly broadcasts with a Doppler shift “I’m coming so get the hell out of my way.” The American siren says “look at me” and is vague in its intention. The chase was fun but not easy. The street along the Seine was fairly peaceful but uneven. The car chattered over dark rain-slicked cobblestones glistening in the headlights. I wondered how fast we could stop. The windshield smeared by bad wipers haloed the other car lights into colored blotches, like Taxi Driver. We weren’t driving recklessly, but shouldering past drivers with authority issues and blowing through intersections without crashing are skills I don’t have. The police seemed gradually encouraged to cut more corners. I ground the gears while whipping the squirrelly Opel down a lane reserved for bicycles and taxis. 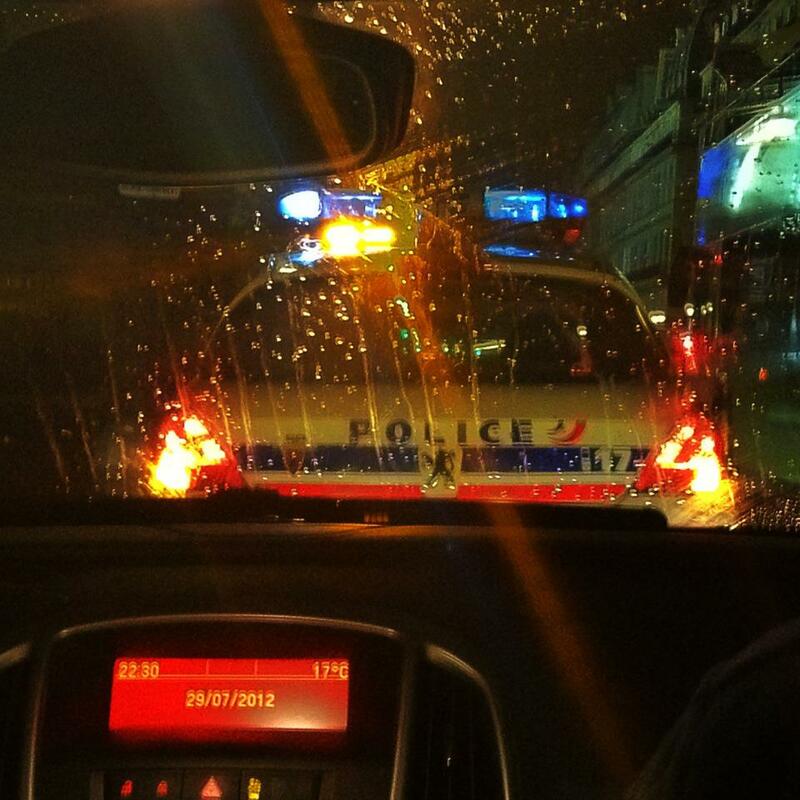 A Parisian promptly cut me off, popping into the police car’s draft. I was not amused. I got the engine whining, downshifted, and punched into a hole to the left. (A stick shift is good for these things.) I passed the interloper and after hesitating jumped back into the lane over a divider, one of those ridges just tall enough to make you fight the steering. I told the gandering kids that we had a lot of firepower if anyone else got wise. They of course thought the spectacle was marvelous. One took a picture. Coincidentally, I’ve been teaching them both to drive. I knew I’d set a bad example if I hit something. I also didn’t want to get the nice police in trouble. Rear-ending the police car, which I was tailgating, was the worst-case scenario. I have to admit this was a really cool way to see the City of Light. Not the typical tourist perspective. Yes, I overplayed my point. We arrived at the the train station, a short trip, in about half the time. We stopped beneath the evil agency’s sign. Three of the police—I never did see the fourth clearly, or I imagined one—came over and asked if I would be all right. A blind donkey could have made it there at that point. I said yes and thanked them a dozen times in both languages. “It’s our job,” the woman said. She smiled and they headed back to their car. It worked. And yes, it was a good story.